If you’re concerned that the wind turbines, mining, field compressors or other sources of industrial or environmental noise (with infrasound, low frequency noise and/or vibration frequencies) may be having an effect on you or your family’s health, one way of seeing whether or not your concerns are justified is to start keeping a detailed journal or diary. If that information can be combined with full spectrum acoustic measurements (including vibration if indicated) the concurrent resident data together with the acoustic survey information may help to determine whether or not the acoustic frequencies are directly causing the symptoms and sensations being experienced. Why will keeping a journal help me? Your local health practitioners – you can use it to demonstrate a correlation between symptoms and noise exposure if there is one. If you are sleep deprived, your memory can be affected, which makes it all the more important that symptoms and problems are documented accurately. Acousticians – who can use it to investigate if any of the acoustic measurements are directly correlating with the times when you are experiencing and reporting symptoms characteristic of noise exposure. A useful example is the detailed instructions which Steven Cooper gave to the residents at Cape Bridgewater in the recent acoustic survey commissioned by Pacific Hydro at their Cape Bridgewater Wind Development, to investigate longstanding complaints of sleep disturbance and other adverse health effects from some local residents. The instructions and one of the resident’s handwritten templates can be downloaded at the end of this webpage. Lawyers – accurate and thorough documentation of symptoms with or without acoustic exposures may prove of assistance if there is subsequent litigation. It is very important to document what happens when you are not noise exposed, as well as when you are, so the comparison can be clearly seen. Exercise book – find an exercise book or something similar. Whatever it is, make sure you use this book only for recording your health data. That way everything is in the one place and it won’t be confused with other information. Computer spreadsheet – use a program like Microsoft Excel (or similar) and record your symptoms electronically. If you use this method, we recommend printing the spreadsheet or backing up the file every so often. 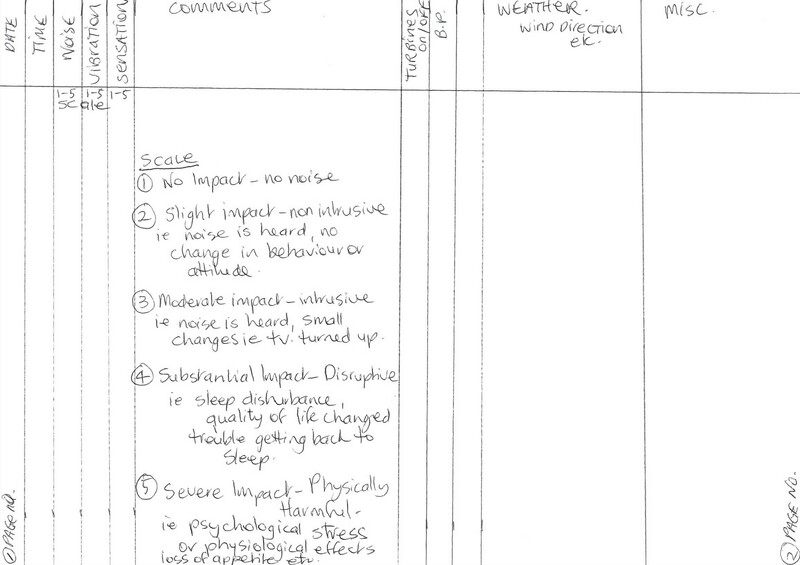 A proforma is available of the Environmental Health Diary used by Rapley and Atkinson during field research in Lithgow, NSW in December, 2015, (funded by the Waubra Foundation). This form was based on the original version developed by acoustician Steven Cooper and the Cape Bridgewater residents for the Pacific Hydro funded Cape Bridgewater Acoustic Investigation by Mr Cooper, 2014-15. That version was subsequently further modified by Dr Rapley and Waubra Foundation CEO Sarah Laurie, with input from Lithgow resident Theresa Grima.